So let’s keep the spring clean and expansion going: I’m going to ask you to spend five minutes a day in stillness and silence. This means creating a little ‘zen den’ – a bit of space where you can take time for yourself. You can make it super easy – just light a candle, sit down, take a deep breath, and use a very simple universal mantra – “so hum”. Silently repeating the word “so” on the inhalation, and then silently repeating the word “hum” on the exhalation. Set an alarm and give yourself 5 minutes of peace. This is how we keep the mind uncluttered – through daily acts of stillness and silence. 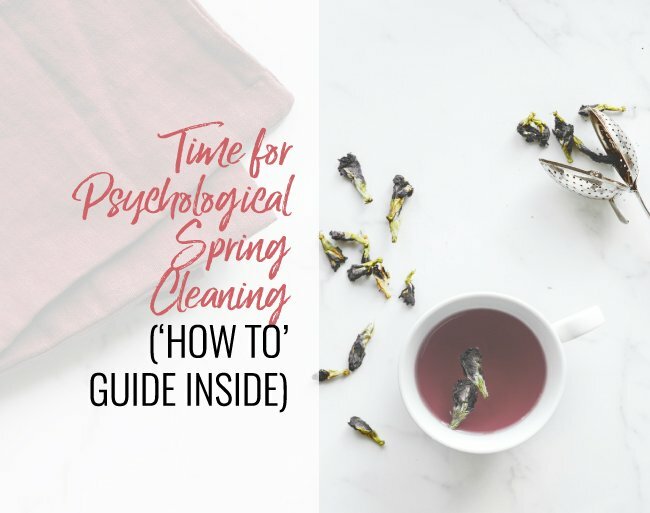 Psychological spring cleaning is important because we always have so much going on in our heads – especially ruminating about things from the past or fearfully projecting into the future. Both of which are sure-fire ways to take you out of THIS moment…and the truth is, the only moment that you will ever be guaranteed in your entire life is this moment, right now. So I don’t want you wasting your beautiful, amazing, one of a kind life in a past that no longer exists except in your mind (as Deepak Chopra would say, “It’s a dream, now.”) Of course we can learn from the past – but ruminating about what did and didn’t happen is not learning from it, it’s really just self-torture. Equally, projecting fearfully into the future not only takes you out of this moment, but it doesn’t actually make you more prepared for the future. Instead of ruminating or projecting fearfully, it might be better to plan for the future – and that is so much easier to do if you have a clean mind space. If you enjoyed this video and blog, please share it on your social media. Also, I would love to hear from you – so please drop me a comment and I hope we have an amazing week cleaning not just your house, but your mind, too! That is exactly my problem, that I recognized this year: my mind is completely full of fantasies! And my private life is unfulfilled! I will use your advice and your tool! This is exactly what i need to do . spring cleaning but in my head. Thanks so much for sharing your knowledge and wisdom. I love the concept of “spring cleaning” phsycologically!! It makes so much sense!! I can’t thank you enough for your words of wisdom! Thank you Terri, love the video. Is anyone else having a problem downloading the journal? Hi there- I just did it without a problem. Can you try again, please? Thank you Terri. Yes, I do need to meditate for 5 minutes, and really breathe from now on when I walk my dog around the block. Also, lately I am making ME time, however, yes, I need to clean my mind of the negativity. I feel you, Jacqueline. All of the things you mention are boundaries issues in some form or fashion. So maybe that is a place to start. Thank you for being here with us! Hello lovely lady! Our last chat inspired me to air my emotional laundry to my boyfriend that I’ve been keeping inside. Unsure if that will lead to the changes I hope for but I’m happy I spoke up for myself and feeling emotionally “detoxed” so I thank you for that!